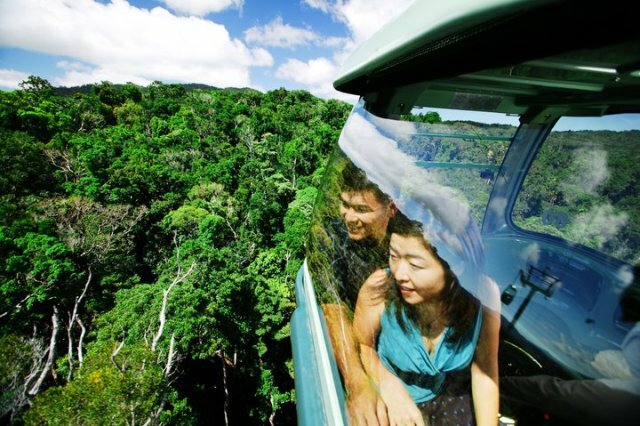 This package combines Skyrail Rainforest Cableway with the famous Kuranda Scenic Railway for a full day tour experience. 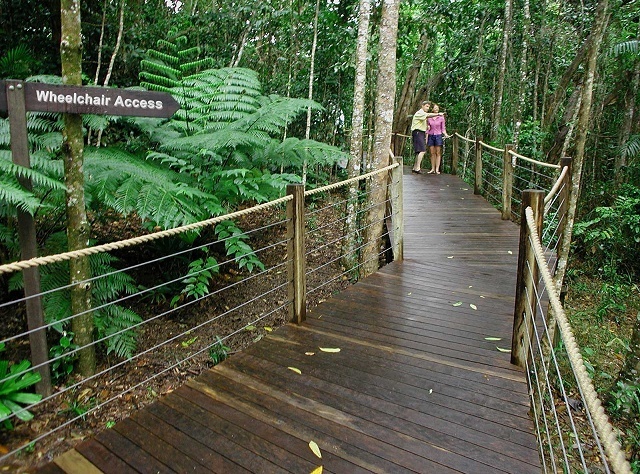 Please advise the number of hours free time in Kuranda in additional notes. Skyrail offers a range of coach departure times from Cairns City Hotels including 8:30am, 9:30am, 10:30am and 1:30pm. This option is ideal for people who prefer a late start or a half day tour. Experience this magical journey in your own time. Skyrail Canopy Cafe and retail shop located at the Smithfield Terminal is open from 8.00am. 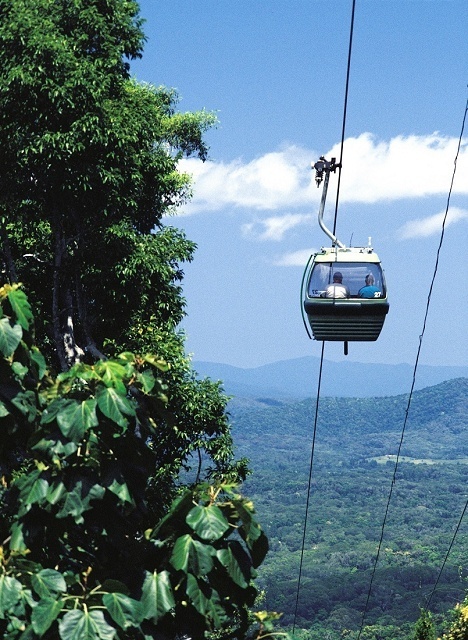 Skyrail Smithfield Terminal is a 15 minute drive from Cairns and 50 minutes from Port Douglas. Self-drive passengers will find Skyrail's location easily accessible with free car parking. Freshwater Connection - is the only Cairns departure point when booking this option. Situated in the suburb of Freshwater with views of the surrounding mountains, visitors can enjoy a hearty breakfast (extra cost) in authentic antique railway carriages. The Station also includes a railway museum, pioneer cottage, gift shop. Self-Drive: If you have your own vehicle, you will not require transfers from your accommodation. 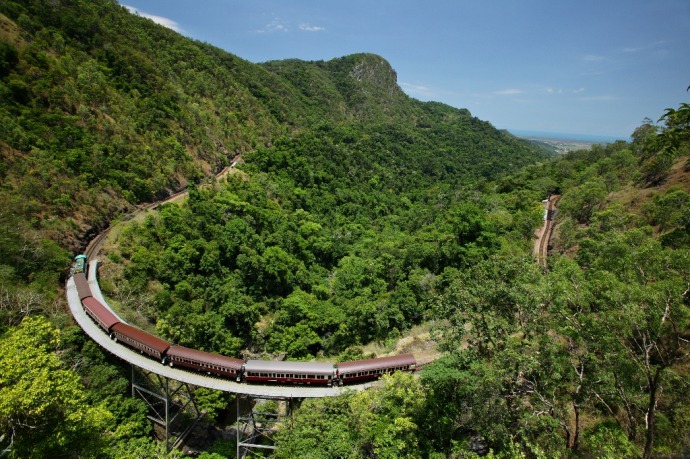 The Skyrail up, Train Down self-drive package includes a one-way transfer from Kuranda Scenic Railway’s Freshwater Connection Railway Station to Skyrail’s Smithfield Terminal in the afternoon. No transfers required: If you select "No transfers required" you will need to make your own way to the Freshwater Train Station in the morning and make your own way back from Skyrail Station at Smithfield in the afternoon. Or, vis versa if you are doing the tour the other way around. Freshwater Station is a pretty station with a museum and a coffee shop in a heritage train carriage. 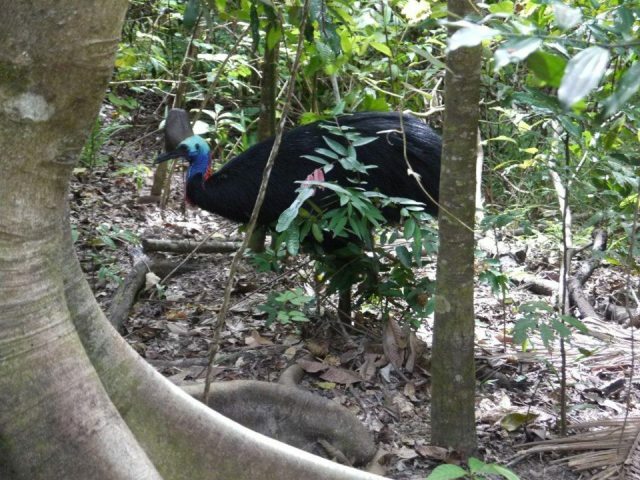 It is about a 20 minute drive from Cairns city. 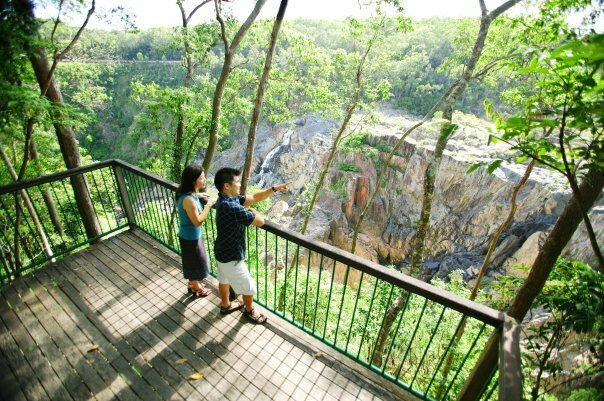 Skyrail Smithfied is about a 25 minute drive from Cairns city. It is not a saving to take a taxi or uber to and from these stations. The "No transfers required" option is designed for holiday makers who have family who are dropping them, and picking them up from each station. Fabulous time had by all of us. 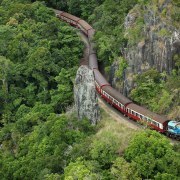 The train was awesome and we learnt a lot from the dislogue. We did the boat too, Warren was a character and very informative. Views from the Skyrail were spectacular. Would recommend to anyone. The service prior to the actual event (ticketing, provision of itinerary etc) was faultless. When I gave the name of the ship on which we would be visiting the port, the customer service officer knew what time it would arrive and depart, and therefore which times to book us for. The excursion was very enjoyable, with no concerns about returning to the ship on time. A tour not to be missed. 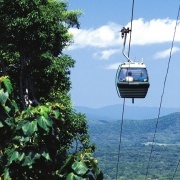 A tour not to be missed when in Cairns old growth forest cableway is fantastic!!! Very nice experience. The lady serving in our compartment in the train was very helpful and accomodating. Thanks for making it a memorable experience. Both the train and sky rail offered great views and we are sure to cherish this trip for years to come. 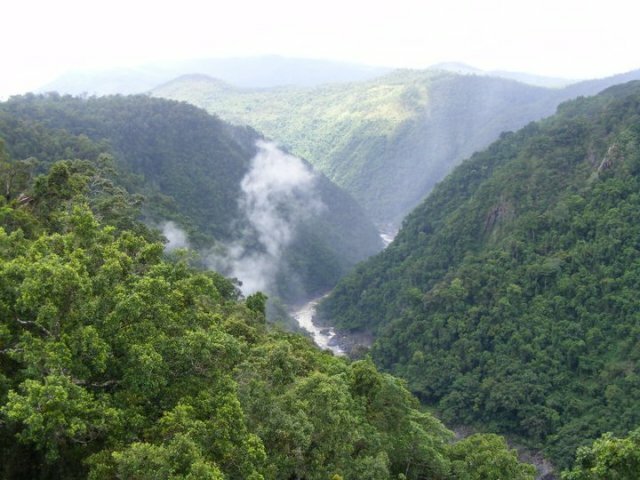 Kuranda was also fantabulous with the things in offer at such a small place. The Frog restaurants food was delicious. The staff concerned with the transfers to the hotel was also very cordial and helped reschedule our trip back home. It was a nice gesture to take the trouble of looking up and arranging for a pick up as we were 30 mins before time. All in all a very good day with family. The only negative I had was the train ride back was very long and very hot. Otherwise it was good and we enjoyed it. 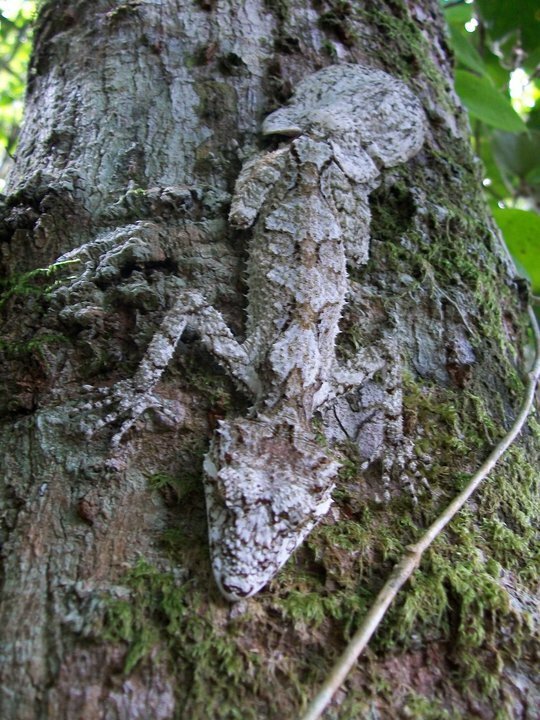 A great way to experience the rain forest region of North Qld and all of its wonders. This trip was the highlight of our holiday. well coordinated for pick ups and drop off. It was a good day out. Not cheap, but worth it for all the views. An awe inspiring day with incredible scenery up and down the mountains. Leisure time in Kuranda with a wander along the riverbank, a magnificent home made hamburger and an icy cold pint to wash it down. Made memories for us that will last forever. We have told several people in the last few days that this is really a must see. Thoroughly enjoyed ourselves! Despite it raining for most of the day we enjoyed the whole day. We took the trip up to Kuranda in the morning on the train the views were outstanding, spending around 4-5 hours in Kuranda itself, unfortunately the weather got worse in the afternoon so could not see too much on the journey down on the Skyrail, but staff were helpful and umbrellas available to visit the lookouts at each stop. Lots of fun; no stress day. I was most impressed with the support provided by Travstar. I had confused my booking date and they were really helpful in changing the day and providing all information I required. Thank you for helping us to ensure we were able to go on the tour. Travstar were a great help in booking our trip to Kuranda and organising our pick up and drop off. Would recommend to others requiring their service. The booking through Travstar was seamless and easy. Everything the consultant said would happen did, with a great \\\"Far North Queensland\\\" smile. Great experience being able to see the all the natural rainforest from the train and sky rail. 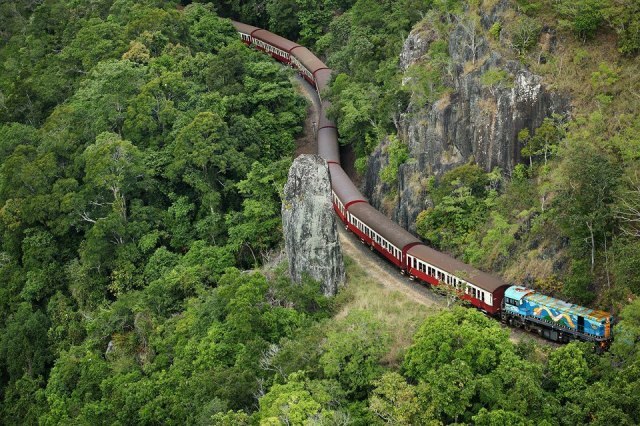 Kuranda is a wonderful place to visit especially by sky rail and with the gold class upgrade just adds that extra benefit to the trip. Friendly and efficient Travstar telephone staff and good follow up and documentation. All ground transport and tour was without any problems. 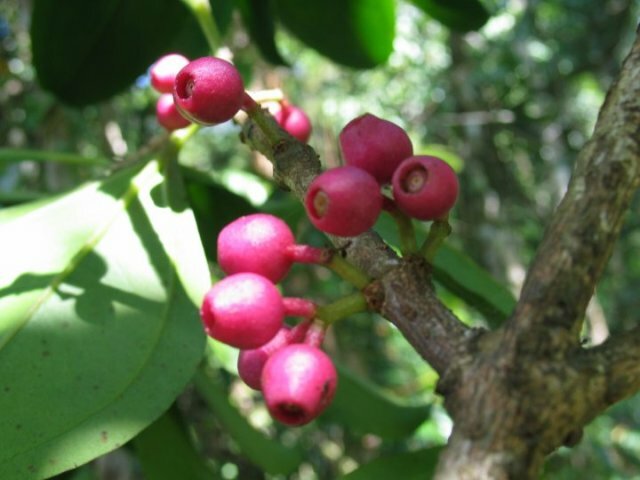 I would certainly recommend Travstar for any Cairns tours. The skyrail was awesome, kuranda was great & the train was great. The lady was very lovely bringing us something all the time on the train trip back.Views were fantastic. Another wonderful tour. Loved the views from cable cars and the steam train was wonderful. Great day out. It was good to get out in the rainforest and kuranda was lovely. The whole trip was a wonderful experience which we will never forget. This trip was fantastic, we loved everything about it! The skyrail, the train and the information on the trails (and the walks). A perfect day!!! A great day out. Up on the skyrail, stopping at each station. Well worth the time, especially Baron Gorge and the Interactive Centre. 3 hours wandering the markets and having lunch. Return on the train. Lots of photo ops. Return transfer to Skyrail with a very funny bus driver. Easy. long and wasted time we could of had at the top. The train ride was great and the staff on the train were too. They even offered to take your photo with your camera if you wanted. The stop at the falls was great and it was running. Kuranda is a lovely, quaint town. A very enjoyable day. 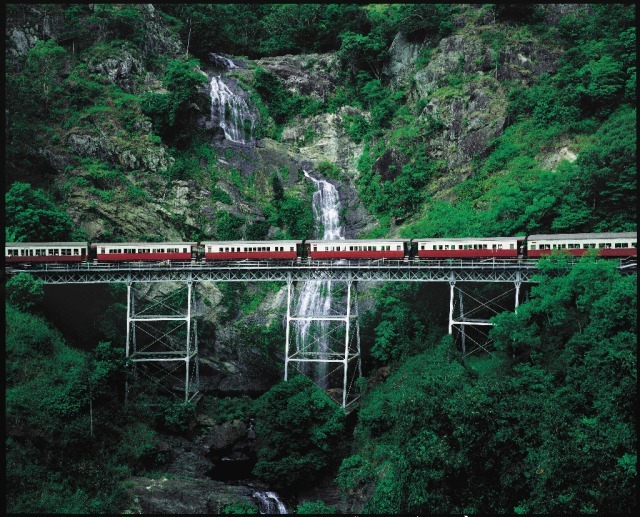 The Skyrail trip is beautiful and Kuranda is a lovely, quaint town. This was really enjoyable. The best part was the gold class on the way back. Beth looked after us really well. Would do it this way again. The ride above the Rainforest was beautiful and we had a good time exploring Kuranda as well as the well-maintained stops along the way. Amazing experience... Train ride was magical!! Loved the skyrail trip up and the train ride down. Loved the skyrail trip up and the train ride down. The village was small so not a whole lot to do. Our family had a fantastic day experiencing the different types of transport whilst taking in the amazing views. Kuranda had something to offer for our 4 and 6 year olds as well as my husband and I. We definately got value for our money. We would highly recommend the day. Even though heavy rain meant we could not see much in either trip we stopped at all stations and walked and looked around. Staff were nice - giving umbrellas to use and pointing out different nature attractions - big spiders and peacock. Amazing transport choice to experience the rain forest. We took the Skyrail in and the train back to the city - both offering distinctive views and history. Highly recommended! Smooth ride fantastic views, great staff. 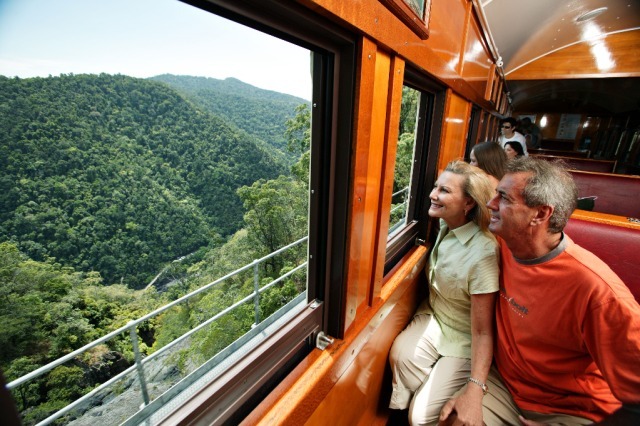 Very enjoyable & satisfying experience with train ride to Kuranda and cable car back. 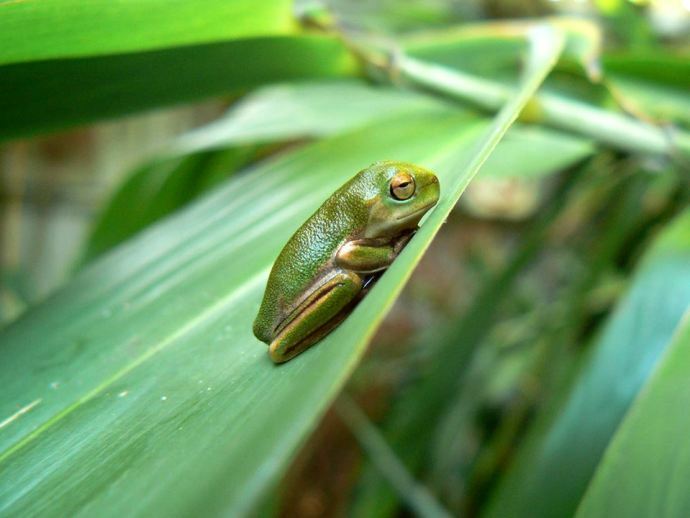 If we had realised that our return trip was much shorter, we would have spent a longer, more leisurely time enjoying the market experiences in Kuranda. Amazing fun and the stops along the way were great. I thoroughly enjoyed the experience of the skyrail and recommend the trip to others. skyrail both ways was great. Sorry the Train was cancelled but the skyrail both ways was great. We all really enjoyed the sky rail. We had a great day taking the skyrail up and then the train down. The staff were just great and the trip was worth every penny. 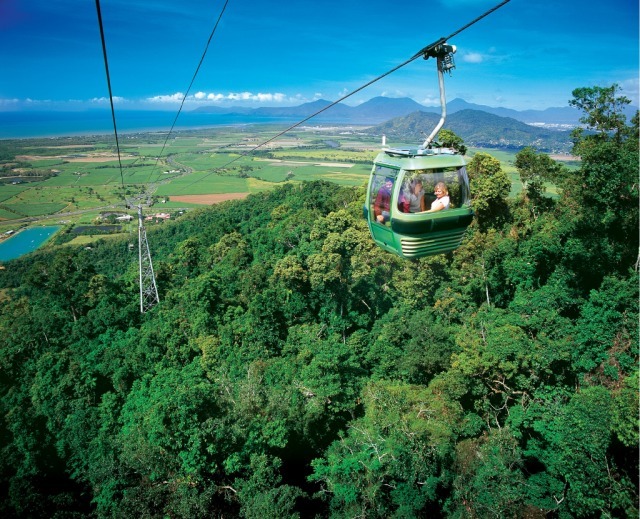 Very good service when booking the trip and once we arrived at the Skyrail in Cairns. Fantastic views and a wonderful experience! We even met sailors from the American war ship Essex that was in town for a few days. They were impressed too! We had a great time and everyone was most helpful. Thanks very much - we will loook forward to our next trip. We had the greatest experience. There was so much to see and do. Excellent tourist asset. Will recommend it to others as a \\\"must do\\\"
The high level of staff courtesy was surprising. Very unusual to have all staff display such wonderful qualities. This was our second time on Skyrail - our first was 100% as it was not peak season. Unfortunately this time was a little too crowded. We still loved the experience.